Born 3rd March 1922, died 25th October 1942 aged 20. Roy, as he was always called was the son of Sidney and Grace Yeomans of 18 Roundwood Way, Banstead. Roy was seventeen when the war started and, like so many others, he declared his age as eighteen in order to join up. He wanted to join the RAF and train as a pilot but he failed the medical through being partly colour blind. He then joined the Royal Sussex Regiment and the photo on the right shows him in his uniform. In 1940, Winston Churchill ordered the Chiefs of Staff to recommend how best to form a new combat arm which was to be delivered to the battlefield by air. The question of recruiting army personnel to train as pilots was a long-standing and contentious issue. Indeed, the Deputy Chief of the Air Staff, Sir Arthur Harris, thought Army flying preposterous: The idea that semi-skilled, unpicked personnel (infantry corporals have, I believe, even been suggested) could with a maximum of training be entrusted with the piloting of these troop carriers is fantastic. Their (the gliders) operation is equivalent to forced landing the largest sized aircraft without engine aid - than which there is no higher test of piloting skill. Churchill's mind was made up; he called for immediate action, and it was agreed that the Army would supply glider pilots with the RAF taking responsibility for qualifying them. THE AIRBORNE FORCES OF THE BRITISH ARMY CONSIST OF PARACHUTE TROOPS AND GLIDER-BORNE TROOPS OF ALL ARMS OF THE SERVICE. Officers and men in any Regiment or Corps (except RAC), who are medically fit, may apply for transfer to a parachute or glider-borne unit of the Airborne Forces...A limited number of officers and other ranks are urgently required for training as glider pilots. Applications for transfer or further information should be made to unit headquarters. The result of this initiative was the formation in 1942 of the parachute battalions and the Glider Pilot Regiment, whose soldiers wore the distinctive maroon beret and cap badge of the Army Air Corps. 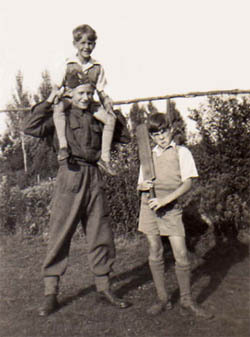 Still wanting to fly, Roy applied for a transfer to the Army Air Corps as a glider pilot and this time he was accepted thus fulfilling his boyhood ambition. The 2nd Battalion Glider Pilot Regiment, Army Air Corps. was created to fly troops and heavy equipment in large towed gliders into areas behind the enemy's front line. Having landed, the glider pilots then fought as infantry or assisted in crewing heavier weapons until withdrawn to fly other missions. Roy attended the Elementary Flying Training School at RAF Booker, High Wycombe, where after the successful completion of his training course, he would have been awarded his 'wings'. By that time, Roy would have gained experience of flying primary trainers (light aircraft) like the Tiger Moth, and the award of the coveted 'wings' was a recognition of qualification as a pilot, irrespective of what he would subsequently go on to fly. From there Corporal Yeomans would have progressed onto gliding training before being posted to his Regiment as an operational Glider Pilot. Sadly it was not to be - Corporal Yeomans was killed during his initial training following a midair collision, when the tail of his Tiger Moth DE619 was struck by Tiger Moth DE456, piloted by Corporal L J Crowe. The collision happened at 1030 hours on the 25th October 1942, as both pilots were preparing to land. Corporal Crowe was seriously injured. The Court of Inquiry concluded that the accident occurred through failure of both pilots to keep an adequate lookout. 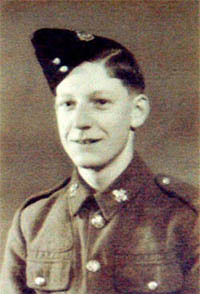 This period was early in the history of the regiment, and Corporal Yeomans never had the opportunity to take part in the now famous glider operations of the Second World War, notably Pegasus Bridge on D-day, Arnhem and the Rhine crossing.The many casualties suffered by the GPR reflected the hazards of glider operations, but their deeds and achievements were outstanding. 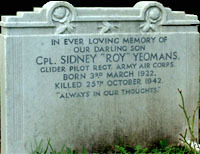 Sidney Roy Yeomans is buried in the churchyard west of All Saints Church Banstead, Surrey. Source - Book entitled 'The War Memorial,St Paul�s Church,Nork, Banstead'. Personal details and photographs from Michael Yeomans. GPR history from : The Army Air Corps Association. RAF Booker course photograph and collision details from Steve Wright of the Glider Pilot Regiment website.